We got the sad news about Dominic Frontiere’s death through an offbeat source: a paid death notice that appeared in the Los Angeles Times. It took an entire day (including calling every funeral home in the Santa Fe area) to confirm the news, and in that time I assembled an obituary that covered the high points of his long career. Frontiere composed several classic themes of 1960s TV — including The Outer Limits, 12 O’Clock High, The Flying Nun, Branded, The Invaders, and The Rat Patrol — as well as such memorable movie scores as Hang ‘Em High and The Stunt Man. He won an Emmy and a Golden Globe and even his forgotten shows had great themes (I especially love The Immortal, Search and his miniseries Washington: Behind Closed Doors). Here is the obituary I wrote for Variety. 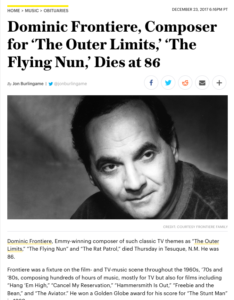 This entry was posted in Composers, Film Music, Obituaries, Television Music and tagged 12 O'Clock High, 1960s TV music, Branded, Dominic Frontiere, Frontiere obituary, The Flying Nun, The Invaders, The Outer Limits, The Rat Patrol, TV music, Variety on December 23, 2017 by Jon Burlingame.